Ratings Results of Interest: On Monday, NBC’s Manifest slipped to a 1.0 rating based on same day viewing for the 18-49 demographic with 5.4 million total viewers (according to the preliminaries) for its season finale. That’s down just slightly from last week’s numbers and this show usually sees notable gains from delayed viewing. Expect a renewal announcement for it at any time. Over on FOX, The Passage held at a 0.9 rating with 3.5 million total viewers as that one hangs in at just passable levels. On Sunday, AMC’s The Walking Dead slipped to a new series low, pulling a 1.7 rating with 4.5 million total viewers. But that one has already been renewed for a tenth season and could still stick around beyond that. Over on Starz, Counterpart ticked up to a 0.07 rating with 260K total viewers for what will almost certainly be its series finale. Over on CBS, God Friended Me slipped to a series low 0.6 rating with 7.2 million total viewers, but that one has already been renewed for a second season. On Thursday, Freeform’s Siren improved slightly to a 0.17 rating with 518K total viewers. That one probably needs to stick closer to the 0.20 level to be considered safe for a third season renewal. Over on FOX, The Orville remained steady at a 0.7 rating with 3.1 million total viewers after one week off. On Wednesday, History Channel’s Project Blue Book improved to a 0.32 rating with 1.7 million total viewers. That show has already been renewed for a second season. Over on Syfy, The Magicians held steady at a 0.20 rating with 573K total viewers while Deadly Class slipped to a 0.14 score with 416K total viewers. On Tuesday, FOX’s The Gifted remained low at a 0.5 rating with 1.6 million total viewers as that one’s prospects for a third season continue to diminish (see Status Updates below). News Roundup: As expected, Netflix has cancelled both The Punisher and Jessica Jones, the last two of its Marvel Universe shows, after having already cancelled Daredevil, Luke Cage, and Iron Fist. But there is still hope that any or all of those could be revived on another platform. Also coming as no surprise, Syfy has cancelled its high-cost sci fi / horror series Nightflyers after one low-rated season. Less expected was the news that Amazon’s alternate history series The Man in the High Castle will be ending with its fourth season, but the show’s producer has promised an “epic” finale. 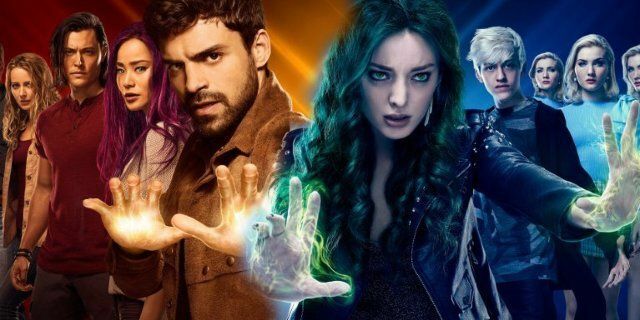 Matt Nix has suggested that The Gifted could continue on one of the streaming services if FOX does not renew it for a third season. Starz’s American Gods, which has its second season debut on March 10th, could be on track for a third year renewal. In development news, Marvel is teaming with Hulu to bring several adult animated series to that streaming service including Howard the Duck and Tigra & Dazzler. And BBC studios is adapting Michael Moorcock’s Runestaff books. You can read about those and more at this link. Deadly Class (Syfy, Status – Renewal Possible): This show is currently performing well for a Syfy series as it is their second highest rated show of the season. It looks to be on track for a second year renewal if it holds around current levels. The Gifted (FOX, Status – Cancellation Likely): This is currently FOX’s lowest-rated show and it is not seeing enough in delayed viewing gains like it did last year. The network does own the show and it is part of the X-Men franchise, so that works in its favor. But even series creator Matt Nix does not have much confidence in the show returning for another season on FOX. I am moving this one to Cancellation Likely status and it could definitely use a Call to Action from fans on the social networks.